Halloween season is a great time of year. The seasons are changing, cooler weather is welcomed, and everyone is looking forward to all of the fall holidays. However, Halloween does present some unique dangers that can affect your pets, one of which is accidental access to a large amount of candy. So how much chocolate is too much? 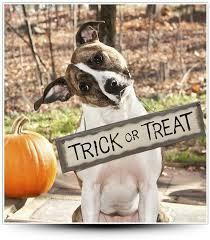 Here is an easy calculator you can use if your dog has helped himself to your candy stash. http://veterinaryclinic.com/chocolate/calc.html . Please be advised that this is for reference only. Contact us immediately if your dog has consumed any amount of chocolate to confirm if and what treatments may be needed! And other Halloween recommendations: Make sure all of your inside pets are wearing identification in the event they escape while you are entertaining Trick or Treater’s. And, if possible, keep all outdoor pets inside on Halloween, particularly your black cats! The increased traffic and people out and about can spook your outdoor pets causing them to become lost. Have a wonderful, and safe, Halloween! !